The theory of political religion concerns governmental ideologies whose cultural and political backing is so strong that they are said to attain power equivalent to those of a state religion, with which they often exhibit significant similarities in both theory and practice. In addition to basic forms of politics, like parliament and elections, it also holds an aspect of sacralization related to the institutions contained within the regime and also provides the inner measures traditionally considered to be religious territory, such as ethics, values, symbols, myths, rituals and for example a national liturgical calendar. Political religious organizations, such as the Nazi Party, adhered to the idealization of cultural and political power over the country at large. The church body of the state no longer held control over the practices of religious identity. Because of this, Nazism was countered by many political and religious organizations as being a political religion, based on the dominance which the Nazi regime had (Gates and Steane). Political religions generally vie with existing traditional religions, and may try to replace or eradicate them. The term was given new attention by the political scientist Hans Maier. Totalitarian societies are perhaps more prone to political religion, but various scholars have described features of political religion even in democracies, for instance American civil religion as described by Robert Bellah in 1967. The term is sometimes treated as synonymous with civil religion, but although some scholars use the terms equivalently, others see a useful distinction, using "civil religion" as something weaker, which functions more as a socially unifying and essentially conservative force, whereas a political religion is radically transformational, even apocalyptic. The term political religion is based on the observation that sometimes political ideologies or political systems display features more commonly associated with religion. Scholars who have studied these phenomena include William Connolly in political science, Christoph Deutschmann in sociology, Emilio Gentile in history, Oliver O'Donovan in theology and others in psychology. A political religion often occupies the same ethical, psychological and sociological space as a traditional religion, and as a result it often displaces or co-opts existing religious organizations and beliefs. The most central marker of a political religion involves the sacralization of politics, for example an overwhelming religious feeling when serving one's country, or the devotion towards the Founding Fathers of the United States. Although a political religion may co-opt existing religious structures or symbolism, it does not itself have any independent spiritual or theocratic elements - it is essentially secular, using religious motifs and methods for political purposes, if it does not reject religious faith outright. Typically, a political religion is considered to be secular, but more radical forms of it are also transcendental. The 18th-century philosopher Jean-Jacques Rousseau (1712-1778) argued that all societies need a religion to hold men together. Because Christianity tended to pull men away from earthly matters, Rousseau advocated a "civil religion" that would create the links necessary for political unity around the state. The Swiss Protestant theologian Adolf Keller (1872-1963) argued that Marxism in the Soviet Union had been transformed into a secular religion. Before emigrating to the United States, the German-born political philosopher Eric Voegelin wrote a book entitled The political religions. Other contributions on "political religion" (or associated terms such as "secular religion", "lay religion" or "public religion") were made by Luigi Sturzo (1871-1959), Paul Tillich (1886-1965), Gerhard Leibholz (1901-1982), Waldemar Gurian (1902-1954), Raymond Aron (1905-1983) and Walter Benjamin (1892-1940). Some saw such "religions" as a response to the existential void and nihilism caused by modernity, mass society and the rise of a bureaucratic state, and in political religions "the rebellion against the religion of God" reached its climax. They also described them as "pseudo-religions", "substitute religions", "surrogate religions", "religions manipulated by man" and "anti-religions". Yale political scientist Juan Linz and others have noted that the secularization of the twentieth century had created a void which could be filled by an ideology claiming a hold on ethical and identical matters as well, making the political religions based on totalitarianism, universalism and messianic missions (such as Manifest Destiny) possible. An academic journal with the name Totalitarian Movements and Political Religions started publication in 2000. It was renamed Politics, Religion & Ideology in 2011. It is published by Taylor & Francis. the control of education, in order to ensure the security, continuation and the veneration of the existing system. the belief that the ideology is in some way natural or obvious, so that (at least for certain groups of people) those who reject it are in some way "blind"
Not all of these aspects are present in any one political religion; this is only a list of some common aspects. Political religions compete with existing religions, and try, if possible, to replace or eradicate them. Loyalty to other entities, such as a church or a deity are often viewed as interfering with loyalty to the political religion. The authority of potential religious leaders also presents a threat to the authority of the political religion. As a result, some or all religious sects are either suppressed or banned. An existing sect may be converted into a state religion, but dogma and personnel may be modified to suit the needs of the party or state. Where there is suppression of religious institutions and beliefs, this might be explicitly accompanied by atheistic doctrine as in state atheism. Juan Linz has posited the friendly form of separation of church and state as the counterpole of political religion but describes the hostile form of separation of church and state as moving toward political religion as found in totalitarianism. Loyalty to the state or political party and acceptance of the government/party ideology are paramount. Dissenters may be expelled, ostracized, discriminated against, imprisoned, "re-educated", or killed. Loyalty oaths or membership in a dominant (or sole) political party may be required for employment, government services, or simply as routine. Criticism of the government may be a serious crime. Enforcements range from ostracism by one's neighbors to execution. In a fundamental political religion you are either with the system or against it. A political religion often elevates its leaders to near-godlike status. Displays of leaders in the form of posters or statues may be mandated in public areas and even private homes. Children may be required to learn the state's version of the leaders' biographies in school. Political religions often rely on a myth of origin that may have some historical basis but is usually idealized and sacralized. Current leaders may be venerated as descendants of the original fathers. There may also be holy places or shrines that relate to the myth of origin. Revolutionary France was well noted for being the first state to reject religion altogether. Radicals intended to replace Christianity with a new state religion, or an atheistic ideology. Maximilien Robespierre rejected atheistic ideologies and intended to create a new religion. Churches were closed, and Catholic Mass was forbidden. 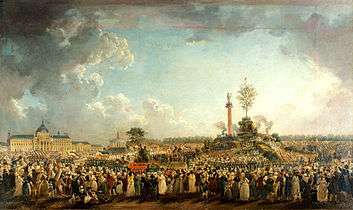 The Cult of the Supreme Being was well known for its derided festival, which led to the Thermidorian reaction and the fall of Robespierre. According to Emilio Gentile, "Fascism was the first and prime instance of a modern political religion." "This religion sacralized the state and assigned it the primary educational task of transforming the mentality, the character, and the customs of Italians. The aim was to create a 'new man', a believer in and an observing member of the cult of Fascism." "The argument [that fascism was a ‘political religion’] tends to involve three main claims: I) that fascism was characterized by a religious form, particularly in terms of language and ritual; II) that fascism was a sacralized form of totalitarianism, which legitimized violence in defence of the nation and regeneration of a fascist 'new man'; and III) that fascism took on many of the functions of religion for a broad swathe of society." "Among committed [Nazi] believers, a mythic world of eternally strong heroes, demons, fire and sword - in a word, the fantasy world of the nursery - displaced reality." Heinrich Himmler was fascinated by the occult, and sought to turn the SS into the basis of an official state cult. Klaus-Georg Riegel argued that "Lenin's utopian design of a revolutionary community of virtuosi as a typical political religion of an intelligentsia longing for an inner-worldly salvation, a socialist paradise without exploitation and alienation, to be implanted in the Russian backward society at the outskirts of the industrialised and modernised Western Europe." The North Korean government has promulgated Juche as a political alternative to traditional religion. The doctrine advocates a strong nationalist propaganda basis and is fundamentally opposed to Christianity and Buddhism, the two largest religions on the Korean peninsula. Juche theoreticians have, however, incorporated religious ideas into the state ideology. According to government figures, Juche is the largest political religion in North Korea. The public practice of all other religions is overseen and subject to heavy surveillance by the state. During the long rule of president Saparmurat Niyazov large pictures and statues of him could be seen in public places in Turkmenistan. In an interview with the television news program "60 Minutes", Niyazov said the people of Turkmenistan placed them there voluntarily because they love him so much, and that he did not originally want them there. In addition, he granted himself the title "Türkmenbaşy", meaning "Leader of all Ethnic Turkmens" in the Turkmen language. A book purportedly authored by Niyazov, Ruhnama ("Book of the Soul") was required reading in educational institutions and was often displayed and treated with the same respect as the Qur'an. The study of Ruhnama in the academic system was scaled down but to some extent continued after Niyazov's death (in 2006), as of 2008. Sociologist Robert Bellah argued in 1967 that Americans embrace a common civil religion with certain fundamental beliefs, values, holidays, and rituals, parallel to, or independent of, their chosen religion. 1 2 3 Maier, Hans, ed. (2004–2012) [1996-2003]. Totalitarismus und politische Religionen [Totalitarianism and political religions (3 vols.)]. Routledge. p. 108. ↑ Keller, Adolf (1936). Church and State on the European Continent. London. p. 68. ↑ Voegelin, Eric (1999) . Die politischen Religionen [The political religions]. The Collected Works of Eric Voegelin, volume 5. University of Missouri Press. ↑ Gentile, Emilio. "Political Religion: A Concept and its Critics - A Critical Survey". Totalitarian Movements and Political Religions. 6 (1): 25. doi:10.1080/14690760500099770. ↑ Maier, Hans, ed. (2004–2012) [1996-2003]. Totalitarismus und politische Religionen [Totalitarianism and political religions (3 vols.)]. Routledge. pp. 110–111. ↑ "The Sacralization of Politics in Fascist Italy". Harvard University Press. ↑ Gentile, The Sacralization of Politics in Fascist Italy, p.ix. ↑ Eatwell, Roger (2003). "Reflections on Fascism and Religion". Totalitarian Movements and Politics Religions. 4 (3): 145–166. doi:10.1080/14690760412331329991. Archived from the original on September 18, 2008. ↑ Burleigh, The Third Reich, (London: Macmillan, 2000) pp.8-9. ↑ N. Goodrick-Clarke, The Occult Roots of Nazism (Wellingborough: the Aquarian Press, 1985), and P. Levenda, Unholy Alliance (New York: Continuum, 2002). ↑ Riegel, Klaus-Georg (June 2005). "Marxism‐Leninism as a political religion". Totalitarian Movements and Political Religions. Taylor & Francis. 6 (1): 97–126. doi:10.1080/14690760500099788. ↑ Bellah, Robert Neelly (Winter 1967). "Civil Religion in America". Journal of the American Academy of Arts and Sciences. 96 (1): 1–21. Archived from the original on 2005-03-06. From the issue entitled "Religion in America". Gentile, Emilio (2005). "Political Religion: A Concept and its Critics - A Critical Survey". Totalitarian Movements and Political Religions. 6 (1). Gates, Donald K.; Steane, Peter (2009). "Political Religion - The Influence Of Ideological And Identity Orientation". Totalitarian Movements & Political Religions. 10 (3/4): 303–325. doi:10.1080/14690760903396310. Vondung, Klaus (2005). "National socialism as a political religion: Potentials and limits of an analytical concept" (PDF). Totalitarian Movements & Political Religions. 6 (1). Jacques Ellul,The New Demons. Trans. C. Edward Hopkin. New York: Seabury, 1975. London: Mowbrays, 1975. Religion and Foreign Policy Initiative Council on Foreign Relations.